One of the most famous temples of Lord Rama and Goddess Sita in South India is the famous Sri Sita Rama Swamy temple situated on the banks of the river Godavari at Bhadrachalam in the Khammam district of Telangana. The sacred, rich and unique history of the temple attracts millions of devotees from all over the world. Its history showcases the concept of unity in diversity which has been one of the hallmarks of Indian ethos from ancient times as it is one of the rare Hindu temples which had Muslim patronage and many benevolent Muslim rulers were responsible for the maintenance of the temple and preservation of its treasures for many centuries. The temple has been made famous by the great devotee of Lord Rama, Saint Ramadasa and its hallowed grounds have been rendered pure and holy by spiritual seekers, saints and sages from ancient times. Bhadrachalam has been closely associated with the epic Ramayana. According to legends, Saint Bhadra (Bhadragiri) was the son of Mount Meru and the Apsara Menaka and an ardent devotee of Lord Rama. He performed rigorous penances at Dandakaranya forest, which is said to comprise the present town of Bhadrachalam and was visited by Lord Rama, Sita and Lakshmana during their exile (Vanavas). Lord Rama’s retreat was said to be the forest in the vicinity of the temple and 32 km from here is the exact spot Parnasala where Rama constructed a hermitage and spent his exile with Sita and Lakshmana on the advice of Sage Agasthya, and it was here that Ravana abducted Sita. Lord Rama while searching for Sita could not fulfil the desire of Saint Bhadra and promised to grant him liberation on his return after successful completion of his mission. The saint continued his penances until the end of Treta Yuga even after the Rama Avatar had ended. Lord Vishnu then took the form of Lord Rama and appeared before Saint Bhadra and granted him his desire. It is for this reason that the town and temple came to be known as Bhadrachalam after the saint Bhadra and ‘Achala’ meaning immovable and the idol of Lord Rama is similar to Lord Vishnu with four hands having Shankh (Conch), Chakra (discus) and Dhanur Bhanu (Bow and arrow). Another legend stated that in the 17th century there was an ardent devotee of Lord Rama named Dhamakka who belonged to the lineage of Shabari and who lived one mile from this holy place in the village of Bhadrireddypalem. One night Lord Rama appeared to her in a dream and asked her to trace the idols of the Lord which were hidden for a number of centuries. She immediately set out in search of them and found the deities hidden in an anthill. Untiringly she poured water from the Godavari into her pots and washed the anthills thoroughly. To her joy her faith was rewarded and she found the idols of Rama, Sita and Lakshmana which had been embedded in it and performed worship and Naivedya (holy offerings) with fruits fallen from the nearby Palmyra tree. With the help of the local villagers, she then constructed a Mandapa for housing the idols. These Swayambhu dieites (self-manifested) are said to be extremely rare and sacred. Unlike many temples in India, this temple does not have a Sthalapurana (culled out from various Puranas) nor has it been claimed to be built by Gods or Sages. 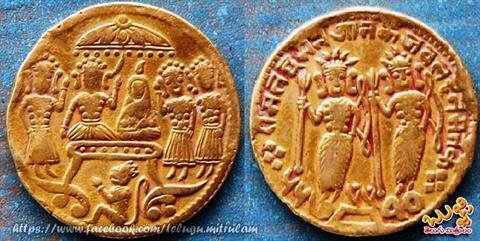 It is claimed to be ‘Manushya Pratishta’ or consecrated by a human being who was a mendicant from Ayodhya. He took up his abode on the small hillock and carved the image of Lord Rama and built a small temple over it. One of the greatest saints and devotees of Lord Rama was Shri Ramadasa. He was born in the year 1620 AD in Nelakondapalli in Telangana and was named Kancherla Gopanna at birth. His parents were Kancherla Linganna and Kamamba and his uncles were Madanna and Akkanna, who were civil servants to Tanishah, the last Qutub Shahi King of Golconda. The king subsequently appointed Gopanna as a Taluk official (Tehsildar or revenue official) whose duty was to collect revenues for the King. Gopanna diligently performed his duties while his love and devotion for Lord Rama increased day by day. One day on his visit to Bhadrachalam for a fair, he was greatly disturbed by the dilapidated condition of the place. He began to raise funds for the renovation of the temple. When he found himself short of funds at the last stage of reconstruction, he decided to complete it by paying the deficit from the land revenue he had collected for the King. The King on learning about the misappropriation dismissed him from his job and threw him in prison. Finally after much suffering of 12 years, it is said Lord Rama and Lakshmana themselves appeared and returned the money to the King and Ramadasa as he was known for his devotion to Lord Rama was later released. The gold coins which were given by the Lord to Tanishahi known as Rama Tankas having the symbol of Rama Pattabhishekham can be seen to this day. He later attained salvation, but his memorable songs and kirtanas are famous even to this day. The King Tanishahi recognised the greatness of Ramadasa and encouraged him in his piety and devotion. Shri Ramadasa expanded the temple, constructed Gopuras and Mandapas and made arrangements for conducting Lord Rama’s festivals in a grand manner which continues to this day. After Tanishahi’s dynasty, the temple came under the purview of the Asaf Jahi dynasty, which ruled from Hyderabad and till recently an endowment grant from the Nizam’s treasury ensured the upkeep of the temple. It has now come under the directives of the Hyderabad Government. It is said that once Saint Kabir was proceeding to pay homage to the deities when Gopanna was climbing the hill with some pilgrims. The Hindu zealots of the temple refused to allow Kabir being a Muslim to enter the temple. To the astonishment of everyone present, the deities vanished and only when Gopanna prevailed upon the temple priests to permit Kabir to be allowed entry did the deities reappear. Gopanna then realised that God was beyond caste, creed and religion and received benediction from Kabir, who conferred on him the name Ramadasa. The temple is situated on an elevated hillock with 40 steps. The main entrance has a tall inspiring Gopuram, which takes one into the inner Prakara of the temple. The main shrine has the image of Lord Rama while adjacent to this stands the Utsava Vigraha of Lord Rama with Devi Sita and Lakshmana on either side. 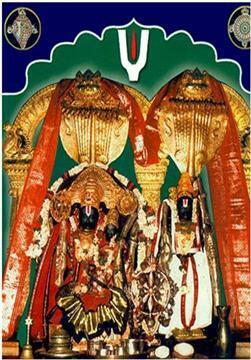 The idol of Lord Rama in Bhadrachalam is called Chaturbhuja Rama as he has four hands. This idol is very rare and said to be very significant for ritual worship. The beautiful and captivating idols of Rama, Sita and Lakshmana are captivating, and the sheer workmanship and excellence of the sculptures attract devotees from all over the world. Lord Rama stands in the ‘Tribhanga’ (thrice bent) pose instead of the usual ‘Samabhanga’ (equipoise) pose. Mother Sita stands near him in the ‘Tribhanga’ pose with a lotus in one hand and the other hand in ‘Katyavalambita’ (palm perpendicular to the ground and resting on hip) posture. Air- The Ghanavaram airport at Vijayawada is the nearest airport. Rail- The Koththagudem railway station is the nearest railway station at 40 km. Road-Private buses ply from Koththagudem and there is a good road network to other towns and cities. The temple offers accommodation at Sita Nilayam with several rooms A/c and Non A/c and cottages. Besides this, there are also small and big hotels according to the budget. There are dormitories at the State Run Punnami Bhadrachalam. Prasadam is sold outside the main entrance of the temple. There are mess halls which serve lunch and dinner. The temple is open from 4.30 in the morning up to 9.00 in the night and closes during the noon hours. Shri Ramanavami and Vaikunta Ekadashi are celebrated very grandly here. The deities are taken around in procession on a well decorated ‘Hamsavahana’ accompanied by fireworks and lights. The Vaikunta Dwar of the temple is thrown open to the public on this day. The Kalyana Mahotsavam or the auspicious wedding of Lord Rama and Goddess Sita is celebrated on the holy Rama Navami festival day. During the occasion of Karthik Purnima in the month of October- November, pilgrims take a holy dip in the Godavari. The temple and the nearby holy places associated with Lord Rama give the whole place a sacred and sublime atmosphere. The spiritual vibrations of the great saints and sages who have visited this temple in the past and its rich history has sanctified the place to enable devotees to transcend the infinite cycles of birth and death and with devotion and purity attain the higher goals of self realisation and bliss.